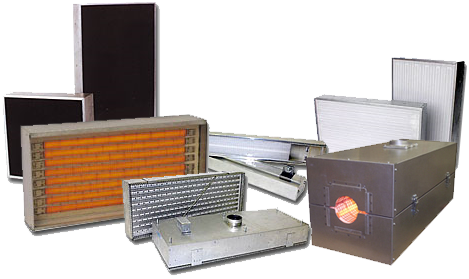 PROTHERM, LLC engineers and builds high quality cost effective Electric Infrared Oven Systems specifically designed for individual applications. Our prices and lead times are as if they were prebuilt catalog items. Oven systems are defined as infrared heaters, controls, and a frame which often incorporates insulated housings, conveyors, exhaust hoods, air ducting, cooling tunnels and other peripherals required for the process. With recent government “Green” initiatives and mandates to reduce carbon footprints, Protherm, LLC Electric Infrared Equipment is the ideal choice to reduce emissions and utilize a clean energy efficient heat source. We take a common sense approach to the design and keep it simple for ease of operation, maintenance, and shipping. All PROTHERM, LLC ovens are fully assembled at the factory, completely tested, and ready for installation at the job site with a minimum of preparation and field wiring required. 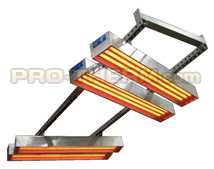 For the oven heat source, PROTHERM, LLC offers a variety of the highest efficiency electric infrared heaters, each with their own heating advantages and unique characteristics. 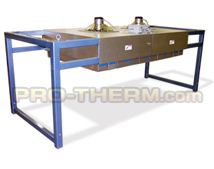 All heaters are completely manufactured by Protherm, LLC, assuring you the highest quality, proper application, long life, and support for the life of the oven. Product temperatures of 150 degrees F to 600 degrees F are common for PROTHERM, LLC Ovens, while higher temperatures can be achieved. With decades of application experience in industrial process heating, specifically in long and medium wavelength IR heating, PROTHERM, LLC applications specialists are competent to assist you with defining your process heating solution. By assessing the project, calculating heat loads, testing your product, designing and building, all done in house, it guarantees you quick service, competitive pricing, highest quality, and some of the shortest lead times in the industry. PROTHERM, LLC- Big enough to meet your needs, small enough to quickly respond to them. The following pages are some of the of the general oven styles that we offer. 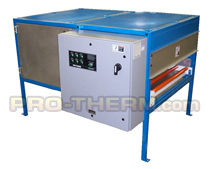 Infrared Booster Ovens- Preheat or pre-gel ovens commonly used in finishing industry for faster line speeds and/or to shorten convection ovens. Flat Belt Ovens- Conveyorized ovens used in a wide range of applications and industries. Overhead Conveyor Ovens- Ovens used with overhead conveyors. Chain on Edge/Spindle Ovens- Ovens used with chain on edge/spindle conveyors. Tow Line/Trolley Ovens- Tunnel oven over an in floor tow line/trolley conveyor typically used for large products such as automobiles. Batch ovens- Oven housing used for stationary batch processes. Web Dryers- In line oven used for processing continuous web products such as paper, film, foils, and textiles. Tunnel-Clam Shell ovens- Oven chamber that can close around a continuous strand or sheet of product such as wire, tubing, or sheet metal coil, or extrusions. Miscellaneous- Various heater banks and custom heater configurations. Warranty summary: Protherm, LLC infrared heaters and equipment are warranted to be free from defects in material and workmanship for 1 year or 2,000 hours, whichever is first, from the date received by the customer, providing that the units have not been misapplied. Other component warranties will be honored according to their individual specifications. This warranty does not apply to damage resulting from transportation, misuse, or abuse. Evidence of field modifications or repair voids the warranty. The liability of Process Thermal Dynamics, at Protherm, LLC’s option, is limited to the repair, replacement, or refund of purchase price, of faulty material or workmanship, FOB Brandon, MN, which upon examination prove to be defective within the warranty period specified. For complete information see “Limited Warranty”.